Oil-Fried Egg on Toast - A recipe from Savor California, the online showcase for extraordinary gourmet foods and beverages from California. Heat sauté pan to medium-high. Add L’Autunno or Everyday Extra Virgin Olive Oil, depending on how much olive you want to taste. Break the egg into the shimmering oil and pop the yolk. At the same time, toast a slice of rustic bread and butter it with salted butter. 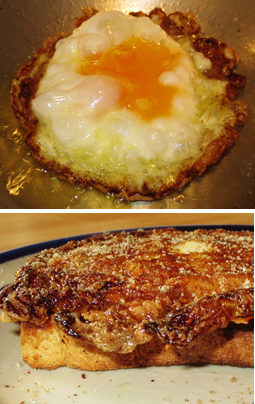 When the egg is crispy and browned around the edges (will be lacy), turn the egg over. Turn off the heat to solidify the yolk. Serve on the toast with a sprinkling of salt and pepper.